Thanks to Big Pippin’s Daily Chart Art for today, I’ve got a comdoll trade idea for this week! 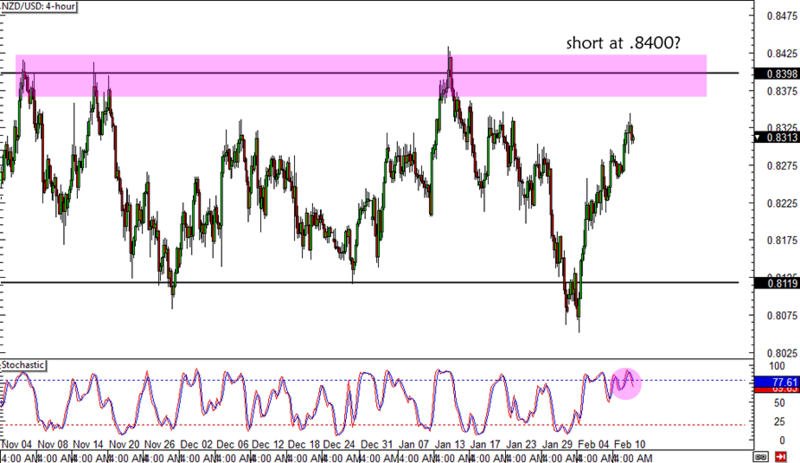 He pointed out that NZD/USD has been stuck in a range for quite some time already and looks ready to test the top. The pair has found support at the .8100 major psychological handle and resistance at the .8400 mark. I’m thinking the recent run in risk appetite spurred by Yellen’s testimony in front of Congress could push the pair closer to the top of the range before stochastic heads lower and puts Kiwi bears in control. If I’m able to short around .8400, I plan on putting a tight 50-pip stop just above the top of the range. I’ll aim for support at .8100 if risk aversion pops back in the markets but I’ll move my stop to entry once price hits the middle of the range. Let me know what you think of this idea!